The Equine programs at Lamar Community College will help you launch your career in the equine industry – no matter what your plans or educational needs are! Why Should I Consider Lamar Over Other Colleges? Here at Lamar Community College, you have access to state-of-the-art facilities including and indoor arena and three outdoor arenas. Classrooms are attached to the barn, making it easy for you to learn in the classroom and immediately go apply that knowledge in the barn. Also, in certain programs like EBM, you get to bring your own horse to school. The best part? You have the opportunity to ride seven days a week. Plus, LCC is a small college with a great community feel. You get plenty of one-on-one attention, both with instructors and other staff on campus. The HTM (Horse Training and Management) program is arranged in a sequence of courses designed to effectively combine theory with practical, hands-on experience. Students “green break” at least three colts and then specialize train one additional horse in barrel racing, cutting, reining, working cow horse, roping disciplines, and more. Finally, after completing three semesters on campus, students go on an internship with a trainer of their choice to finish their degree while gaining real-world experience in the exact field in which they intend to pursue a career. The EBM (Equine Business Management) program is designed to help students improve their horsemanship skills, while sharpening their business knowledge. Students spend three semesters on campus, completing classes both in the classroom and hands-on with horses in the barn. They work to create a business plan that they can immediately put into action once they graduate. After three semesters on campus, students go on a semester-long internship with a business partner of their choice where they gain real-world experience, doing the work they love every day. Both the HTM and EBM degrees are designed specifically to prepare a student to enter the workforce after two years of school. For those individuals who wish to pursue a four-year degree, LCC offers an Equine Science degree. These students still get the benefit of working hands-on with horses, but their courses are designed to transfer seamlessly to the four-year college or university of their choice. What Other Equine Programs Does Lamar Community College Offer? Associate of Applied Science in Horse Training & Management, Barrel Horse Training- The A.A.S. in HTM – Barrel Horse Training provides students with the skills to train the barrel horse (body control). Upon completion of the degree, students will be able to take a green or older horse and train it on barrels. Starting Colts Certificate- This one-year certificate program is designed to provide students, through hands-on experience, with the skills and knowledge needed to break colts for riding. Fundamental Horse Training Certificate- This one-year certificate program is designed to provide students with the basic knowledge and skills needed to train horses. Advanced Horsemanship Certificate- This two-year certificate program builds upon the skills and knowledge acquired in the Starting Colts certificate program. It combines hands-on experience with a one-semester internship with a professional trainer. Admission to this certificate program requires successful completion of the Starting Colts certificate program, or permission of the program instructors. I Am Interested in Horse Training and Management, What Can I Expect to Learn? In the Horse Training and Management, you will start with the basic care and training to build a solid base of knowledge, and then jump right into working on green breaking your colts. Students work with horses to learn biting and driving; standing while being saddled, bridled and mounted; taking proper leads; backing and loping in circles; stopping; two-tracking and opening gates. Once you’ve mastered these skills, you will move onto advanced performance training and, ultimately, specialized training. In Equine Business Management, you will start with the basics to ensure you have a solid base of knowledge to build on, but you’ll learn quickly in our two-year program. Students start basic horsemanship including safe handling and riding of the western horse, then move on to intermediate horsemanship and maneuvers, improved body position, and advanced control. Provides the student intermediate to advanced horsemanship and maneuvers with emphasis on individual work. Corrective training, tune-ups, etcs. Courses cover the practical aspects of horse and stable management, feeds and nutrition, diseases and wounds, unsoundness and blemishes, castration, immunization, worming, health care, care of feet and legs, organizing stable routine and activities, stable records and stable construction. Focuses on marketing methods and promotional advertising methods for stables, trainers and horses. How Can a Degree from LCC Help Me in My Equine Career Pursuits? Both the HTM and EMB degrees are set up as an Associate of Applied Science (AAS) degree, which means you’ll spend two years learning skills to prepare you to enter the workforce once you’ve completed your degree. In these programs you will spend less time in the classroom and more time working hands-on with the horses, learning practical skills to prepare you to enter the industry, either working for someone else or starting your own business. An Equine Science degree is an Associate of Science (AS) degree, which is designed specifically to transfer to the four-year college or university of your choice. Will Lamar Community College Guide Me on the Best Courses for My Particular Career Goals? The course description is set but, since LCC is small and has such dedicated faculty, many of the aspects of the courses can be tailored to reflect each student’s future plans, including the business plan. For example, students in the same course have created plans to start breeding farms, training facilities, boarding facilities; some students want to be self-employed, while others want to work for an established organization. What Do Students Say About Lamar Community College? LCC has built my knowledge, confidence, and resume more than I could have ever imagined. More than that, though, it has provided me with a plan so that I can successfully start my career as soon as possible. 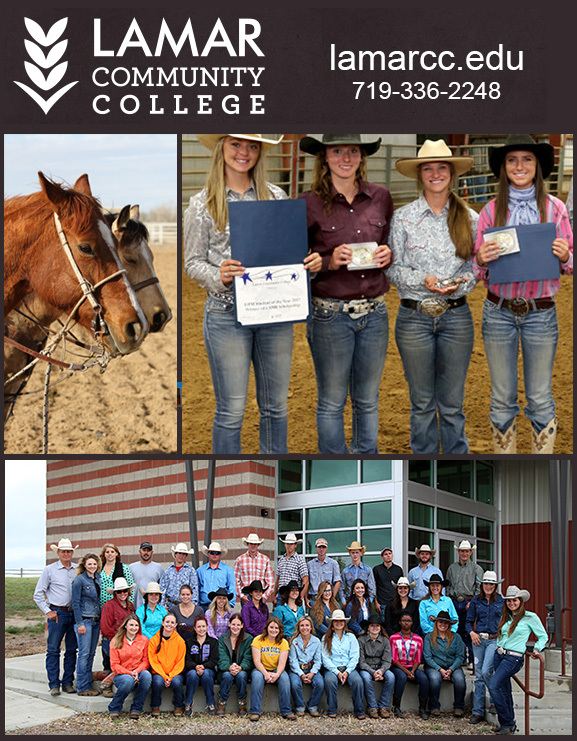 Get The Equine Education You Need for Your Dream Career at Lamar Community College! We know you may have a great deal of questions and research to do before enrolling, so we invite you to visit us at our website to learn about our courses in depth. Have questions about the programs or how to get started? Just contact us! We can’t wait to partner with you in pursuing whichever program appeals to you, as you get the essentials you need for a lifelong career in the equine industry. We are here to help you every step of the way and welcome your phone calls today!